Order quality hand made wooden and bone turned lace bobbins in many different styles and with a large variety of woods available to choose from. We also stock a large range of lace tools, jewellery and pens. Sixpenny can also supply spangling equipment, giving you the option to personalise your own bobbins with our range of beads and charms. All of our lace bobbins are hand turned and finished and sent in secure packaging to help ensure safe delivery anywhere in the world. 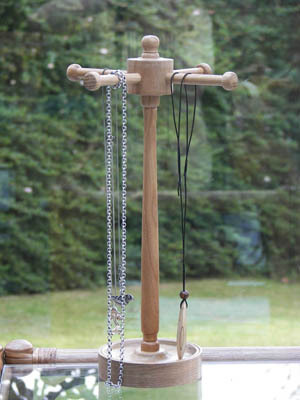 Our lace bobbins and other turned items are made from reclaimed wood where possible. Do you run a craft related website? Link sixpennybobbins.co.uk on your site and send us a message containing a link to your site, and we will add you to our own links section!